Panorama inside sunlight-dappled Port Koube, Ouen, New Caledonia. Soft, weather-worn peaks frame Port Koube, reputedly a hurricane hole. New Caledonia. 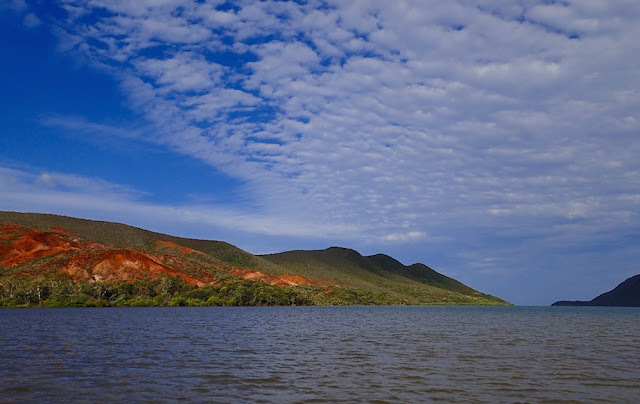 For newbies to New Caledonia, Port Koube, properly lit (the hillsides, not us, though one could say the latter came later), was quite beautiful. 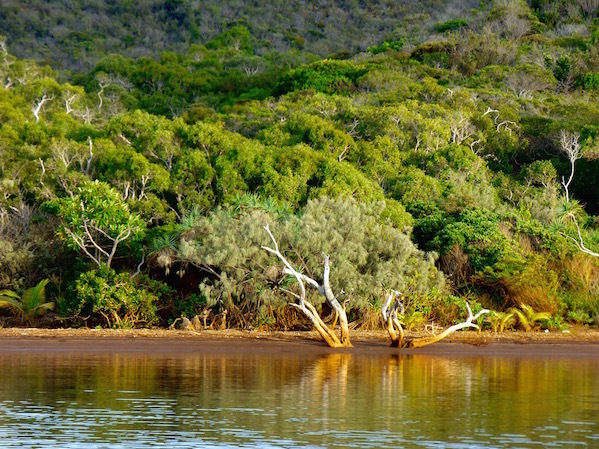 Port Koube’s enclosed by a ring of undulating hills, wrapped in a blanket of green and golden grasses, dotted with a mix of scrub and trees, ravaged with mining scars, exposing vibrantly orange earth, darkened periodically to a deep umber. 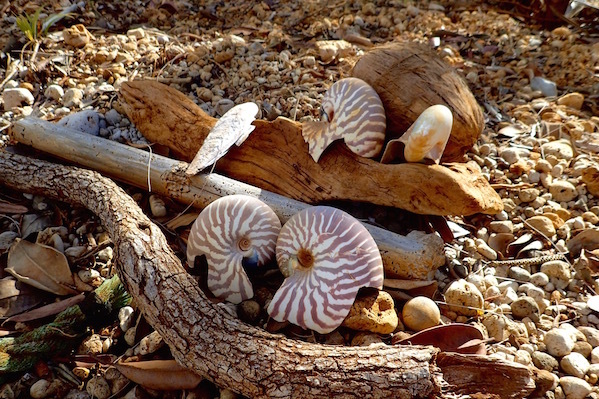 Nautilus shells and a cuttlefish bone, artfully scattered across Port Koube’s shore. New Caledonia. We’d been looking forward to meeting Rich and Cyndi for nearly a year, ever since reading their awesome blog highlighting their favorite Bay of Islands anchorages in New Zealand. We invited them to a thank you dinner. 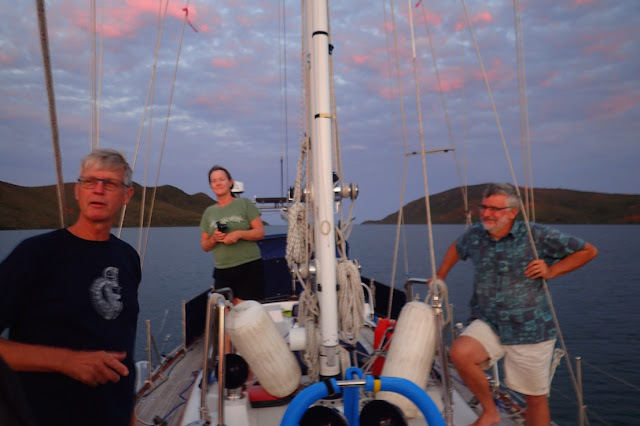 Already committed to spending time with their cruising friends Bob and Linda of s/v Bright Angel, they countered with sundowners (sips and niblies) aboard Bright Angel. They’d all enjoyed buddy boating together, but we each headed opposite directions the next morn, but graciously, we were included, and got to add our hellos to all the farewells. Native plants clamber across Port Koube’s seemingly inhospitable rocky outcroppings. The bright orange gash is a holdover from previous mining. They all stopped by our boat prior to welcome us in and give us a quick overview of the Bay. “Check out the nautilus shells,” they told us. 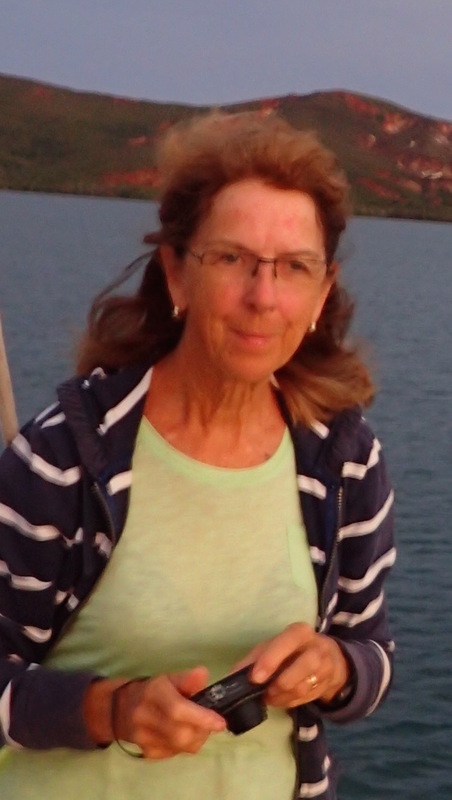 “There’s lots and we left some ashore.” While Rich, Cyndi, Bob and Linda stopped, we showed off our still; we were looking for ways to thanks Rich and Cyndi for all the fantastic info they’ve shared which gave us some of our best cruising highlights in New Zealand and Fiji. 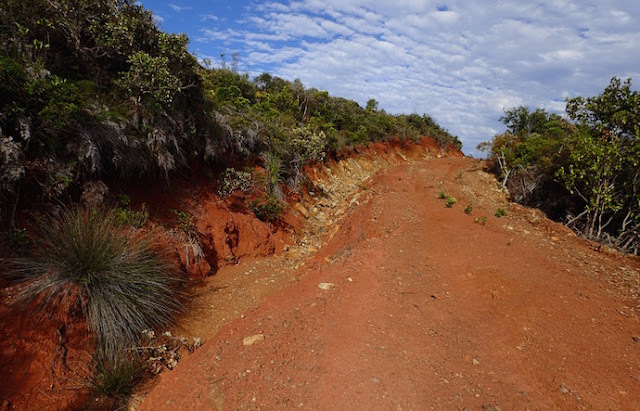 The first of many clay-like sturdy orange “dirt” roads intersecting New Caledonia. Koube Bay near Prony, New Caledonia. We enjoyed our short dinghy ride ashore, wandering the fringe of the mangroves, while lazily soaking up the late afternoon sun. 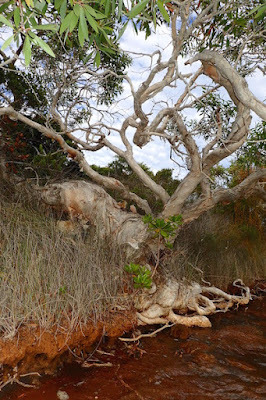 Then we took a short jaunt along the shore side road. All this in a land where it looked like some great hand casually reached down from the sky and pegged the color saturation bar to 100%. against Port Koube’s intensely orange soil. Then it was time for "sundowners" board Bright Angel. We brought some true “boat drinks,” gin made from our still, mixed with diet tonic from our soda stream, diet soda stream burbled diet cran-raspberry mixed with rum from our still, and the piece du resistance, B52s (the best ever adult milkshake!) made with coffee liqueur we made from our own distilled spirits and an Irish cream also “boat made,” thanks to a fabulous recipe from Mark of Amelllie IV. All were a hit, as was sharing a spectacular and photogenic sunset. The next morn, before heading off to Noumea, Rich generously stopped by to troubleshoot why my phone wifi hotspot wasn’t working. Eventually, he figured it out – thank you Rich! 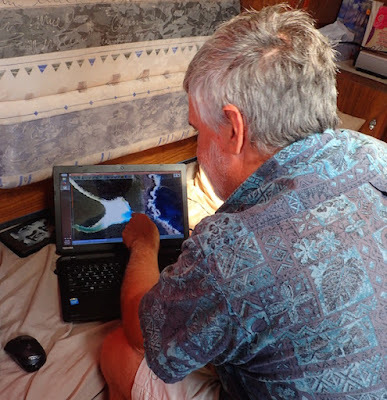 Then he shared a whole slew of Google Earth KAP downloads with Wayne, showing him some spots they enjoyed stopping at in New Cal, as well as giving Wayne a few Open CPN pointers. Again, thanks, Rich! Bob, Rich and Cyndi pop out of imbibing in Bright Angel’s comfy cockpit to see the real sun down, off Bright Angel’s bow. take of Port Koube’s deep magenta sunset. All too soon, we scattered like leaves on the wind, each headed our separate ways, though we hope to meet again. 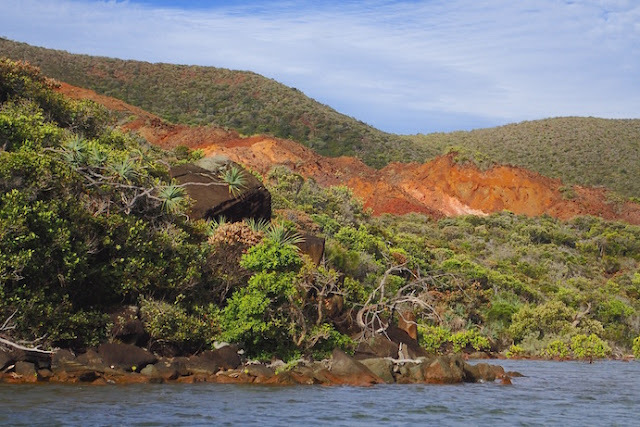 For us, maybe because it was our first official New Caledonia cruising stop, or maybe because of our newfound friends, Port Koube is something special. If this was mediocre in New Caledonia, we could hardly wait to explore the really good stuff! gives Wayne some New Caledonia Open CPN files and pointers. We stopped in Port Koube (S22..26.279 E166.48.179), Ouen, New Caledonia September 27, 2016. By the time this posts we'll likely just have arrived back in Noumea, for provisioning (and more wifi!) before we head back out for more New Caledonia cruising. their bases tea-stained by the local soil.